Fun, exciting, infectious! Magneto ignite audiences whenever they hit the stage. 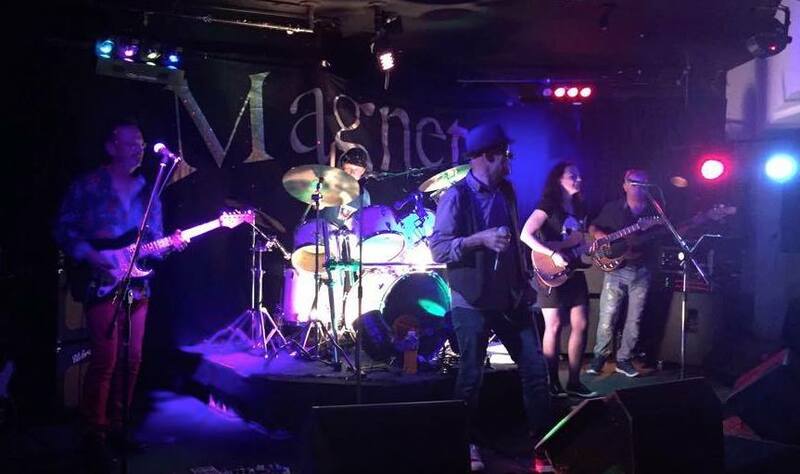 Taking well known covers and the occasional obscure wonder song, Magneto infuse every tune with their special sauce…a bit of extra kick and grunt, a bit more wildness, and all delivered with the class you’d expect from seasoned musicians. The tight, pulsing grooves from the rhythm section drives Magneto, willing crowds to the dancefloor. Then add the sometimes wild but always tasteful guitars, great vocals and harmonies, and a dash of mystery and you have something special. Magneto appear at venues across the Mid North Coast of NSW. Steve hails from Birmingham UK, a city well known for its music and sound. He has played bass with many artists around Australia’s East coast .Steve has also toured as a drummer and produced albums for artists in Melbourne. He forms half of the dynamic and driving rhythm section for the Magneto sound. Rick has been a frontman for many popular Sydney bands from the 70’s to current. Bands such as Navaho, Fragile, The Kick, Knight Brothers, Bad Sneakers, Tuckitinya, Rocks Up Doc, Lone Strangers and the Pink Chevys.. Rick’ s on stage vocal performances range from heartfelt ballads to high powered contemporary roc, and will move any audience. With over 30 years experience singing all the great hits, one would have to experience a performance to really appreciate Rick’s ability and versatility. At an early age of 8 Steve started playing drums and by 18, was playing the Newcastle circuit. Steve was involved in touring bands in the 80’s such as Sweethearts and Shot in the dark, playing in venues all up and down the east coast. His keen interest in drums led him to a full time profession of playing, teaching and recording. Presently, he is quite content performing around local venues. By now , Steve says he should know what to hit and when to hit it. !! Warren’s guitar style is a blend of passion, energy, taste, and a bit of good old wailin’ crazy wildness when called for, and he has worked in support acts for the elite of the Oz music scene including Dragon and Richard Clapton, in venues such as Chequers, Whisky A Go Go, Bombay Rock and the legendary Bondi Lifesaver. Warren has more recently enjoyed performing in North Coast house bands for touring artists such as Kevin Borich, Ali Penny and Les Karski, and Warren has also had strong involvement in the local blues scene and Bellingen Jazz Festival.